The day had arrived for the Santa Parade, cold and grey. When I signed up to volunteer as a clown, I had been full of optimism. Everything in my life was going according to plan: I had received the promotion I was working so hard for; my offer for a place of my own had been accepted; and my relationship with Sam had been going well. My bubble had burst a couple of weeks ago. I still had a great position at work; and living in my new place was everything that I could wish for. My relationship with Sam, however, had derailed. No longer did I have someone in my life with whom I could share special moments. Instead there was an empty void in my life that left an ache in my heart. I had made a promise many months ago and, no matter how I felt, I did not want to disappoint the many children and families who had waited out in the cold for so long to see the parade. I dressed and put on my makeup – the red clownish smile masking my sadness a little. Armed with my hand clappers and a vuvuzela, I journeyed to the start of the parade. Hopefully in giving joy to others, my sadness would be eased a little. What would you add to this clown’s story? Clowns originated from the court Jesters who had to entertain the power moguls (megalomaniacs) and when they realised theywere wasting their time entertaining the goons they realised their humanity and returned to the people to bring us value in the spirit of life – to live, love and laugh. And I am grateful for that as they often bring a lot of joy and laughter. I am impressed with the capture Colline, and you know I value your writing. Focusing on others is the best cure for sadness. Thank you for the read and the image! I love the image too Paula. And I just felt I had to write something about the person. 🙂 very successfully. I am always intrigued by your plots and charmed by your writing style. Many of them, I am sure, are hiding heartache behind the smiles they paint onto their faces. Sug… ja… soos ons almal maar nê! A heart warming story Colline, like the clown I’m well used to putting a smile on for the clients I work with, but I’m a little scared of clowns, im not sure why. This one is obviously very lovely and caring. I’m sure all those children were grateful that he made it. That is a great effort! Thank you for sharing, Colline! well…. I enjoyed what you wrote – but at first I seriously thought that you dressed up like a clown – but that was only for a split second – because then I remember the floats ands the other posts (lol) and well, what an image!! your words were perfect. and it worked. when I put on my first smile, I began to feel a little better. Then one of the kids had these beaming eyes that went through me – and soon I found that I remembered why I do what I do. because once I am int he flow of my zany job, well it satisfies. I also remembered that feelings follow behavior – and sometimes it takes that first step and that first smile to shake away the blues. I love the way you ended the story Yvette – especially as it is the smile of a child that brings a little peace. A lovely piece of writing to accompany the lone clown photo. It reminded me of that song by Smokey Robinson, ‘Tears of a clown’. I did not recognize the title of the song but knew it as soon as I listed to it! The photo is brilliant and I love the scenario you have woven. 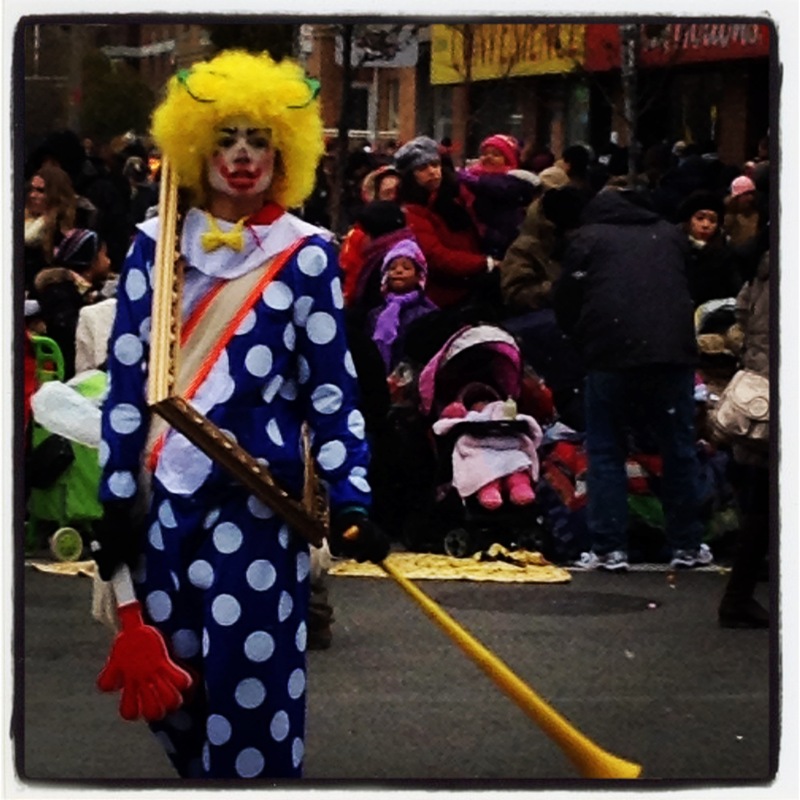 I think the Clown enjoyed her day, her spirit was uplifted because she made people happy and made them smile. While she was “in Clown” she forgot her troubles and she was uplifted also, because by making others happy you make yourself happy. Now, I am retired from that profession, but the memories are rich treasures to me. Now, I try to uplift people through my writing and photography. Thanks for your post–it brought back memories for me. Thank you so much for sharing your experience as a clown. It is good to know that the clown personage not only uplift the spirits of those watching but also the spirits of those acting as the clown. The tears of a clown … Great short, Colline. It’s hard to balance time and priorities and what to sacrifies. Thank you for the compliment Rommel.